Administrators are always looking for ways to perform tasks faster. Most administrators have little time to spare, so I don’t blame them for looking for new techniques. One of the ways in which administrators gain a little extra time is to automate tasks using batch files. Both Administering Windows Server 2008 Server Core and Windows Command-Line Administration Instant Reference provide significant information about creating and using batch files to make tasks simpler. 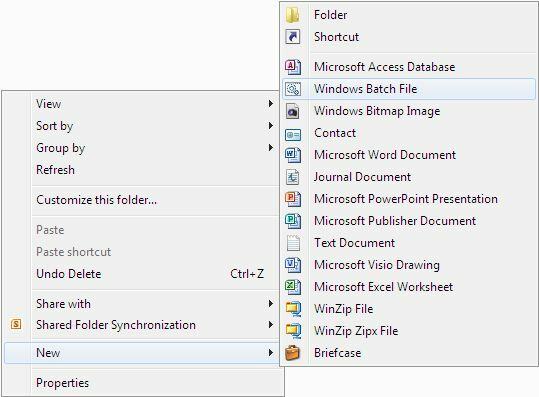 However, a number of readers have asked how to make creating the batch files faster by adding batch files to the Windows Explorer New context menu. That’s the menu that appears when you right click in Windows Explorer. It contains items such as .TXT files by default, but not .BAT (batch) files. Being able to right click anywhere you’re working and creating a batch file would be helpful. Actually, the technique in this post will work for any sort of file you want to add to that menu, not just batch files, but the steps are specific to batch files. Open the Registry editor by typing RegEdit in the Search Programs and Files field of the Start Menu and clicking on the RegEdit entry at the top of the list. Right click the HKEY_CLASSES_ROOT\.bat key and choose New | Key from the context menu. You’ll see a new key added to the left pane. Type ShellNew and press Enter. Right click the new ShellNew key and choose New | String Value from the context menu. You’ll see a new string value added to the right pane. Type NullFile and press Enter. Your Registry Editor display should look like the one shown here. Selecting this entry will create a blank batch file for you in the location you selected. All you need to do is open the file and begin editing it. What other sorts of time saving methods do you find helpful in working with batch files? Let me know at John@JohnMuellerBooks.com.